The Swedish government has formally recognized Palestine as a state Thursday morning, following through with its earlier promise by Prime Minister Stefan Löfven to acknowledge their sovereignty claim. Löfven told the Swedish parliament during his opening address earlier this month that the government would recognize Palestine in an effort to help the peace process between the nation and Israel. His announcement drew both praise from Palestinian officials and criticism from Israel and the United States. Palestinian president Mahmud Abbas on Thursday hailed Sweden’s decision.”President Abbas welcomes Sweden’s decision,” spokesman Nabil Abu Rudeina told AFP, saying the Palestinian leader described the move as “brave and historic”. Abbas called for other countries to follow Sweden’s lead. “All countries of the world that are still hesitant to recognize our right to an independent Palestinian state based on 1967 borders, with east Jerusalem as its capital, (should) follow Sweden’s lead,” his spokesman quoted him as saying. 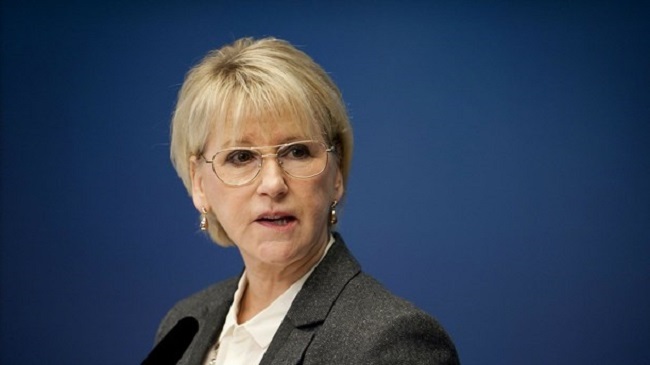 Margot Wallström said recognizing Palestine would make the country more equal while participating during peace negotiations with Israel, as well as offering hope to young people on both sides. Sweden is the first country to recognize Palestine while being a member of the European Union. Responding to the announcement, Israel’s Foreign Minister Avigdor Lieberman called Swedish recognition of Palestine “deplorable”. He said “Sweden needs to understand that relations in the Middle East are more complicated than a piece of furniture from IKEA that you assemble at home,” reports Israeli newspaper Haaretz.